Finances — and his precarious state of health — meant that Robert Louis Stevenson's cruising life could not go on indefinitely. 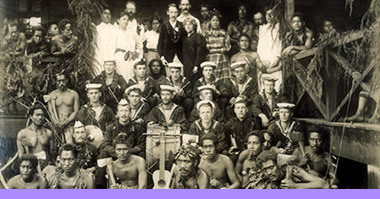 However, he was increasingly fascinated by the Pacific islands and their peoples. Stevenson seemed to enjoy his new role as head of the household at Vailima. He developed an active interest in local politics, and indulged himself by writing letters to 'The Times' about Samoan affairs. The native Samoans quickly adopted this eccentric Scotsman, calling him 'Tusitala', which means 'story-teller'.